Today I want to share with you a super easy recipe that makes a great side at your next BBQ or summer party, or a super easy grab and go for lunch during the week to pair with a salad. Cook your noodles according to the box instructions. While the noodles are cooking, go ahead and cut the tomatoes and cucumbers and shred your cheese. Mix all ingredients together and serve warm or chilled. 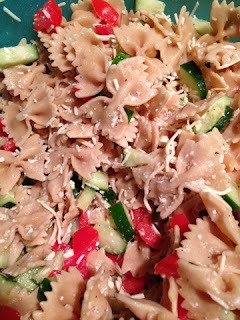 This lasts in refrigerator for several days and can be made ahead! It is actually best when made ahead, as the noodles have time to marinade and soak in all the flavor! 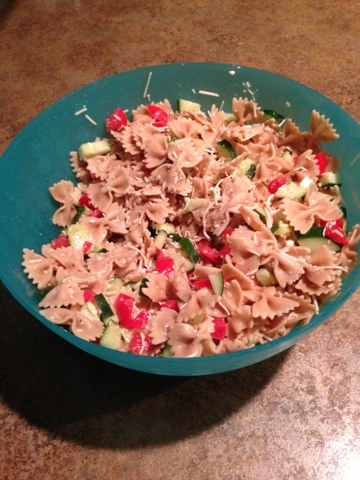 I make a very similar pasta salad! I make it for lunch since it’s so easy and doesn’t have to be heated up. Glad you linked up with Jess and I! I make a similar one with orzo pasta and I omit the parm and add red onions. Love it!